In 2004, a solemn, anxious NYU student caught the attention of indie aficionados with an album largely composed in a bedroom. Soon after, the addition of three more jazz-minded NYU kids turned Grizzly Bear into a four-on-the-floor band, and together they would go on to produce a handful of albums that made their way onto the unofficial, essential soundtrack to Williamsburg gentrification. By 2009, if you listened closely, you could probably hear the entirety of GB’s majestic Veckatimest playing through leaky earbuds on the L train, the line notorious for hauling transplanted creatives in and out of Brooklandia. 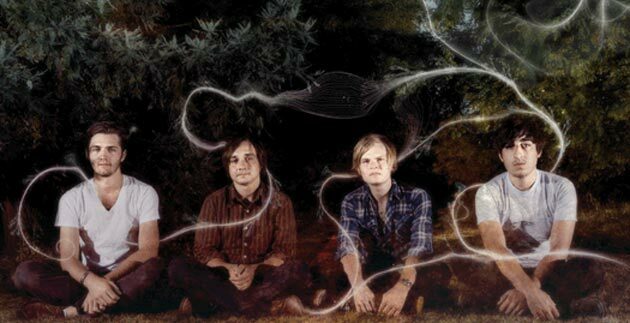 Ed Droste, Daniel Rossen, Chris Taylor, and Christopher Bear did not smile for photos; their albums garnered descriptions like “haunted” and “gloriously eccentric,” and their shows sounded painstakingly, precisely like their albums. From that story you’ve probably figured it out: It’s really easy to roll eyeballs about Grizzly Bear in 2012. Just last month, LA Weekly gorged itself on this sort of clickbait when it made Grizzly Bear number 5 on its list of “20 Worst Hipster Bands.” Blah, blah, yes, we’ve heard the hipster hatred before. And you know what? It’s a shameful disservice. Grizzly Bear has been one of the most reliably masterful bands of the decade, and their latest album, Shields, might be one of the best of the year. So, in the new-journalistic habit of making lists, here are five reasons you should listen to the new Grizzly Bear record. 1. Shields immediately launches into some of the most punchy, soulful sounds Grizzly Bear has to offer. On “Sleeping Ute,” Daniel Rossen’s soft voice runs ragged over jumpy guitar progressions before the instrumentation shifts into those tumultuous, romantic swells the band is known for. Winding down on fingerpicked arpeggios, the track lends solo focus to Rossen’s vocals. The break from GB’s trademark harmonies on songs like these is welcome—after all, that “choirboy” descriptor was getting old. 2. Following the unofficial rule that the second track is always/usually the best, “Speak in Rounds” is a standout. For a band that tends to skip around choruses, they can sure as hell write melodies that ask to be played on repeat. Shields ditches much of the piano-plunking pop of Veckatimest, but the new record musters up just as many brain-clinging progressions as the last—a little patience with the extraneous noise and pensive space-outs is, as usual with Grizzbear, wholly rewarding. 3. “Sun in Your Eyes” is a little over seven minutes long, but if you’re listening to this album, odds are you aren’t sniffing for snappy radio edits anyway. Instead, the last track on the album does exactly what a good Grizzly Bear song should—it picks you up and carries you through piano tinkling and percussive storms—then leaves you feeling like you just rolled up the car window after numbing your face to a sweet, violent breeze. 5. Reason number five to listen to the new Grizzly Bear: The same day that Fiona Apple’s brilliant Idler Wheel premiered on NPR, this was released to internet fanfare. If Grizzly Bear has somehow ceded its band-o’-the-moment cred in order to quietly put out solid, thoughtful albums every few years (and avoid collaborating with Kreayshawn), that’s fine by me. No one needs your haterade, LA Weekly. And if Shields is any indication, it’s all the more reason to look forward to the next great Grizzbear album to untangle.